The evidence keeps sprouting up like daffodils: Experiencing nature is good for us — physically, emotionally, cognitively. (Check out this new study on how a walk in the park can reduce brain fatigue.) But as the world becomes ever more urbanized, which urbanites have enough access to nature to reap these benefits … and how can we make that access more equitable? Enter City Nature — a new project from Stanford University that maps the “greenness” and “paved-ness” of more than 2,500 neighborhoods in 34 U.S. cities (as determined by the shade of remotely sensed pixels) and then lays over that demographic data such as ethnic diversity and average home value as well as access to parks to produce portraits of American urban nature — who lacks it, who has it in abundance, and how those disparities match up with individual city plans and visions. 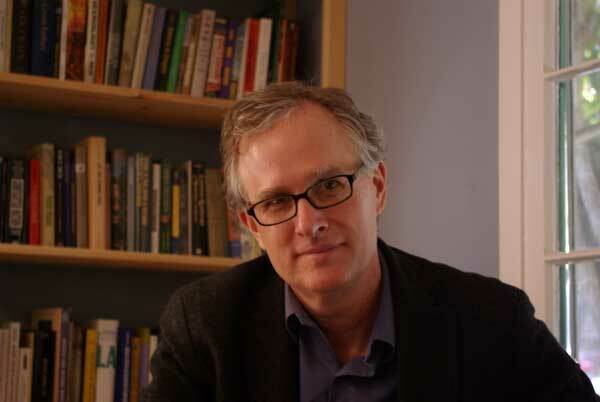 Those disparities are wide, according to Jon Christensen, an environmental historian who is one of City Nature’s two principal investigators and who teaches in UCLA’s History Department and Institute of the Environment and Sustainability. The hope, says Christensen, is that urban planners and activists can use City Nature’s data to eventually pinpoint the neighborhoods that have the greatest “nature need” — and take action. Q. City Nature has a project called “Naturehoods” that measures neighborhood proximity to parks as well as neighborhood levels of “greenness” — which includes plants in backyards, parkways, street tree canopies. What disparities are you finding between parks and greenness across the United States? And does having a park nearby always mean you have “access” to greenness? A. Parks don’t seem to be distributed in U.S. cities in a way that is biased towards any particular class. That’s partly a historical artifact of the way the cities have developed and the flight to the suburbs — there are lots of parks throughout cities. But greenness or unpaved spaces tend to not be evenly distributed. There is a tendency — although it’s not uniform — that greener parts of cities tend to be wealthier neighborhoods with higher per-capita income and higher percentages of owner-occupied homes. That doesn’t mean that wealthy people live only in green parts of town — they can choose to live wherever they want, so they are often found in a lot of different neighborhoods and increasingly, we know, back in dense downtowns where there is often less green space. But the greenest parts of cities often seem to be areas where people have big lots, backyards, lots of trees, nearby open space, and expensive homes. An economist might say these homeowners have made a trade-off. As one person I talked to here in L.A. told me, she doesn’t need a park, she has a big backyard. She’s only been to the local park once in decades. By contrast, the least green parts of town often seem to be home to people with lower incomes and less valuable property. They might have parks, but those parks may be more neglected, run down, more paved over to make maintenance easier for cash-strapped city park agencies, and there are fewer trees and smaller backyards, if any, and less open space around. Q. So there is unequal access to greenness in U.S. cities — how do we fix that? Can we? A. By investing in bringing nature to neighborhoods where it’s possible to do that and where the need is greatest. Nature is a public good, and it’s going to have to be kept alive in these cities through public investment, either by governments or by nonprofits, conservation organizations. It’s an equity issue and a health issue, as we know from other research, not to mention an issue of building a lasting constituency for nature. Q. What in the City Nature data surprises you? A. Just how much variation there is in how U.S. cities have incorporated nature. When we originally started Naturehoods, we thought we might be able to actually lump similar neighborhoods from different cities together in what we called “Frankencities” that would all have similar patterns of nature and development. But the variation is so great that wasn’t possible. I think what this shows is that a lot of the most important historical shaping of nature in cities seems to have happened along the margins —at the neighborhood level — rather than through grand plans. If you live in one of these cities, you can look up your neighborhood in Naturehoods and see that it shares many characteristics with other neighborhoods in your city and around the country. But the amount of nature that you have around you is going to very different from what otherwise similar neighborhoods enjoy. Parks, large and small, will make a big difference, but so will things like trees, gardens, streetside plantings, medians and patches of undeveloped land. To me, that variation also means that we can make a big difference in restoring and maintaining nature in cities. Some of the patterns that are there are explained by big factors, like wealth disparity among different neighborhoods — but not all of them, and not in a way that is really overwhelming. The decisions that people make about their neighborhoods, their visions and plans and how government and conservationists can feed into those decisions, can really make a difference. Another surprising thing: We also began to look at urban plans in these 34 cities to explore how they articulate visions and plans for nature, parks, open space, habitat. We used some digital humanities methods — text mining and topic modeling — to produce an objective measure rather than a subjective one of the words and language used in these plans. And there does not seem to be a consistent, coherent or clear way in which these largest cities in the United States think about nature and articulate a vision and plan for parks and open space and habitat. It’s hard to tell within these plans that there’s a vision and plan for parks and open space that relates to these cities’ visions for themselves. Again, that’s a kind of negative result. But I think also one could look at this as an enormous opportunity for us and for conservation organizations in cities and in individual neighborhoods to make sure that nature in the city is an important, clear, visionary part of plans going forward. It’s especially important because population dynamics over the next two generations are going to double the built environment of cities around the planet. I hope we can do a gap analysis for city nature that could guide choices and priorities. Q. When you look at individual cities such as, say, Kansas City, are there disconnects between what you saw in the city plan and the nature that’s on the ground in neighborhoods? A. Yes. That’s a city that discusses parks and open space in the vision element of its plan. If we think that visions and plans are really important, Kansas City has it. And that makes sense because Kansas City has this great parkway system that was designed by George Kessler, one of America’s great landscape planners. But our analysis shows that the city is below average in discussing parks as community facilities, and parks aren’t mentioned in critical sensitive areas as habitat, and they are not mentioned that much elsewhere in the plan. So the city had a great vision, but I think it’s very likely a historical artifact of that parkway system. Kansas City hasn’t come up with a new vision for the 21st century that has more of the things that we think are important about parks and open space and habitat these days. Q. Back to parks: City Nature looks at people’s access to parks — their “park need,” as you call it. There are a number of studies out that show you don’t need a lot of nature to have a positive mental and emotional health effect on people. So why look at parks? A. We wanted to look at both greenness and parks at the same time, because parks are an important public good — particularly for people who aren’t surrounded by a lot of nature in their daily lives. We have a long tradition of providing parks as a public good here in the United States and really around the world. And the reality is that, even in those neighborhoods that already have parks but don’t have a lot of nature, the most likely and quite possibly only way you are going to get more nature into these neighborhoods is as a public good — i.e., a park. Q. Not through tree-planting initiatives? A. It might be tree planting. It could be through tree planting and bigger medians, or urban farming in medians. There are people in South L.A. doing that. There are opportunities to create pocket parks, neighborhood gardens, little patches of habitat along places like the L.A. River. Again, at that scale, there are going to be dozens of different ways to do this. Q. Are there assumptions about American urban history or environmental history that the data in City Nature could challenge? A. A few. One, that urban vision and plans are really important. It’s not really clear that that’s true. They have great normative power, and we should have visions and plans, but I’m not sure that visions and plans explain that much about this variation. Another assumption our data might challenge is that the great landscape planners like Kessler or the Olmsteds really left a distinctive mark on cities. While they certainly designed some of our great parks all around the United States, including Central Park in New York, when you are looking at nature in cities at this comparative scale, it’s not clear that you can discern any particular difference in the cities where great landscape planners worked versus other cities. Finally, the incredible variation of nature in cities that we’re finding puts the lie to the idea that preserving nature or open space or habitat is somehow an impediment to the rational economic development of cities — an argument that some urbanists make against conservation, be it of nature or historical buildings. This research shows that cities develop, regardless of how much nature they protect. On the one hand, you could say, well, then nature doesn’t really matter for the development of the city, or you could say that’s true, but you can choose to have nature. We know that there are other enormous benefits to having nature, parks, open space, other forms of nature even just outside your window, and that’s a choice that we can make. Q. How would an urban planner use Naturehoods to do that? A. We don’t yet have this combined in a good way with habitat. 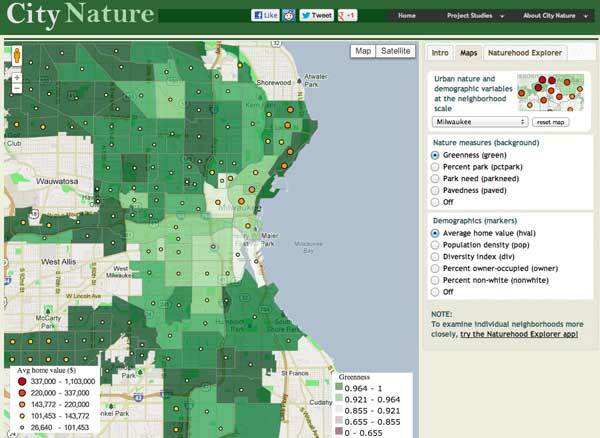 If we combined what Naturehoods shows with the kinds of data and maps that folks at The Nature Conservancy and elsewhere have, we could really add the human dimension to our knowledge of urban nature. If we’re taking seriously the idea that people should be part of the equation when we calculate the benefits of investments in nature and habitat and conservation, Naturehoods could provide a way to do that — a way based on need. There’s a lot of power in doing this kind of comparative analysis, and if we could expand it from 34 cities in the United States to, say, the 6,000 cities or so worldwide that are expected to become home to the doubling of urban population in the next two generations and that have some of the greatest environmental need, then we could potentially make a good contribution to rules of thumb for how those cities are shaped. Because the way that those cities get shaped — and they will have half of the urban population on the planet by 2050 — is really going to determine a lot about the future of how people live with nature and with each other.